Delivered by Adventure Travel Trade Association President Shannon Stowell, October 21, 2009 at the Adventure Travel World Summit, Quebec, Canada. “In the past I’ve delivered ‘state of the industry’ addresses mostly based on facts that the ATTA has gathered and surveys we have done- a lot of quantitative data. Now, as ATTA matures, it’s time to talk about a bigger picture. And we’ve heard you: as we’ve matured, you have raised the bar for us; you’ve asked us to grow in our leadership role and to share our vision. In Fortune Magazine this year an article called Who’s Up, Who’s Down- Ranked within Industries, the opener goes like this: “In a historic year of red ink, among the worst hit were banks, automakers, homebuilders, airlines and hotels. A few industries managed to stay aloft, thanks to the necessity of their products and services: pharma, hospitals and defense.” Clearly we operate in an undervalued industry. This is shortsighted since tourism is a cross-industry catalyst, pouring money into the baseline of a myriad of businesses in multiple sectors. To ignore tourism is to ignore arguably the world’s largest contributor to GDP. We heard why adventure travel matters: transformation, discovery, engagement, web of life, authenticity. These do answer the question in general, but why do we as an industry matter? How would it be different if we were absent? We are one of the few industries that intrinsically can achieve the triple bottom line goal of people, planet and profit. While many businesses struggle to figure out how to either add environmental and social issues to their image or portfolio to become or appear more responsible, we can make them an integral part of our business! More than ever, travelers are interested in the authentic and real. Adventure travel is surging as an interest among travelers worldwide. Tourism boards – from Belize to Jordan to Nepal and Argentina – approached us in 2009 for involvement with their industry events. ATTA’s business philosophy: We believe that your business success is of paramount importance. As one of our panelists said at the very first summit “if you aren’t profitable, no one cares about your passionate views on sustainability and responsibility.” Your ability to have impact is limited unless you are successful. The ATTA’s core strengths have always been on the business side: marketing, business development, partnerships, PR, events like this Summit. We will continue to live in our strength for you, our members and the industry at large. If you think ideals of responsibility, sustainability, social justice, etc., are rare, undoable or unrealistic or for non profits only, let me tell you about just a few stories coming from our members that I’ve gathered while here. In Uganda, one of our members brings tourists to see the gorillas. Without tourists, it is likely that the gorillas would not survive. There simply would be no incentive for the locals to protect them. Similarly in India, one of our members tells us, “More eyes on the tigers protects the tigers”. When an eco-lodge moves in, the tiger population goes up. If you go outside the tourism zone, there are no tigers. A company runs snowmobile tours in Maine- their vision is for the machines to go electric, to be quiet for wildlife and eliminate gaseous emissions. He pressures manufacturers with ideas of how to do so. There are thousands of stories out there and, in fact, are in this audience. We as an industry are getting connected and organized. An industry veteran of 30 years told me the other day that, he has never seen such a spirit of generosity in the industry as now. I think it’s a sign of maturity over fear of sharing information. 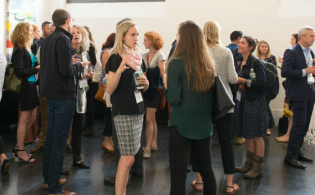 We now gather on an annual basis and connect regularly through many different online communities. We as an industry create partnerships and share best practices. You have helped transform this industry. The last two Summits that the ATTA held were in Brazil and Norway. 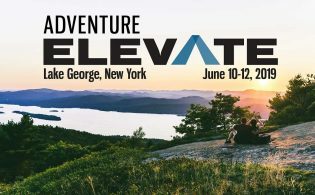 In Brazil, we’ve heard directly from the governmental and associate parties that the Summit has changed the way they view adventure travel and that the industry is now strongly connected and partnering. It has become one of the most successful of their 64 tourism segments. 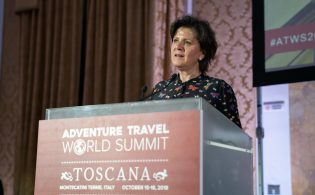 The Summit in Norway confirmed they should adjust toward adventure travel and this helped drive a restructuring of Norway’s focus and positioning as a destination. 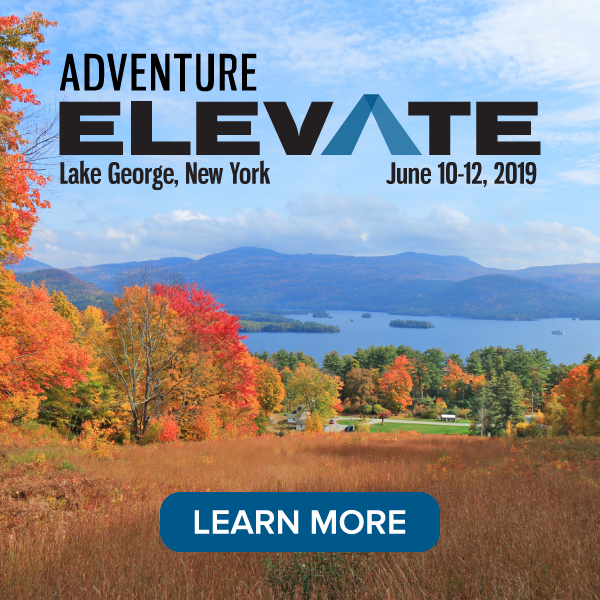 In fact, a $30mm grant they recently won for the Norwegian Center for Excellence was partly due to the Summit-inspired vision for a place that can serve as a center for excellence for sustainable tourism. As we’ve analyzed the story-tellings outcomes and had countless conversations with you, antagonists in our story emerge. There are many troubling issues that are unique to this era- Dr. Reeves threw a glass of cold water on our consciousness last night speaking of biodiversity erosion & climate change. These join issues such as global cultural conflict, distribution disruption on a mass scale, insane levels of consumption, and people becoming increasingly divorced from the land and lost in the electronic world. In reality, underneath it all, there is nothing new under the sun. The same old problems just show up in a different form. Which is why wisdom from the ages is called for when thinking about how to deal with root causes of issues. As Edward and Sheree mentioned, Stories connect us to fundamental truths. Charles Dickens in his incredible story, “A Christmas Carol” features a man named Scrooge who cares nothing for others but focuses only on increasing his wealth even at the expense and extreme suffering of his employees and neighbors- his local economy. In the story he is haunted and warned by three Ghosts. At the apex of the warning, Scrooge is told: ”Above all, beware ignorance and want, and most of all ignorance, for on its brow is written doom unless the writing is erased.” My friends- this is the battle that we already fight whether we are aware of it or not. Against ignorance. Against want. At the root of these are things like greed and gluttony. These are the common enemy. While we may see antagonism in certain camps like mass tourism, governmental policies, etc., in fact it is the human condition that is behind so many of our challenges. Compassion and Love, as we heard from Drs.’ Reeves and Wallace, is called for. And ACTION! There is so much ignorance about other cultures, about environmental impacts, about the consequences and power of our money in local communities. In your work, you destroy ignorance! By creating thriving businesses, you have an impact on want! How more noble a cause can we find so squarely in the path of our daily business? I know tourism is not a silver bullet, but it is part of the solution. Are you in a governmental agency? Support your adventure travel community no matter what stage they are in. They need you…and you need them. It represents a key part of your destination’s future! Are you a journalist? Tell the stories. Are you a technologist? Help solve our industry’s logistical, financial and distribution problems. I can’t list all slices of the industry right now, but clearly we all have a vital role to play! We as an industry are not tiny. We are not a small group of backpackers or extreme sports enthusiasts any more. We represent millions and millions of customers worldwide as a group. Ecolodges, adventure operators, outfitters, safari companies, rafting companies, diving companies, walking tours, the list goes on endlessly. You should know that ATTA has partnered with The George Washington University on two fronts- to develop the Adventure Tourism Development Index (ATDI) to bring sustainability standards to development and we are currently about to come out with market sizing data to put real numbers around this gray area and prove our worth to a world that requires data. But we know instinctively that as a group we do impact millions of travelers and nearly every region on the planet with what we do. And as for action- what is the ATTA’s role in this? We are a catalyst, a hub, a refuge, a facilitator. Most of the impact is and will be made by you! But we will continue to bring together the leaders of the industry to share knowledge, become better businesses and communicate the stories. If we help you in flourish, we achieve our goals. As Brian Rosborough from EarthWatch said last year- YOU are the front line of the army of responsible tourism. As a speaker this morning said- we can be a sort of UN of travel providers- fearless advocates of human rights and environmental protection. Do we have an action plan? YES. Beyond refining what we currently do, we intend to publish a ‘set of principles’. We have listened to you for years, been involved in the discussions and through StoryTellings now have concrete direction on what this industry dreams adventure travel to be and to accomplish. We will then release it for comment by you, the members on The HUB, our membership’s online forum. We’ll continue to refine this living document. We do not intend to be police or regulators. But we will lead, we ask you to lead and together drive this movement. Why does this matter? So the world who hears from us will know what we stand for and in hopes that they will be inspired to do the same. Members- we achieved an all time high of 500 members the week before the summit. Philosophically, the ATTA doesn’t want just anyone as a member. We want the best, collaborative companies from each region- those who are successful in business and hold to the set of principles that help define our community’s basic standards and aim at the triple bottom line. We want the destinations who will measure success not only in number of arrivals, but also ask the questions: are wildlife and environment being protected, are we paying attention to carrying capacities, are local economies benefiting, are resources being protected? That being said, we don’t want to be a community that only agrees with itself- we want to provide resources, motivation and the opportunity for all who are trying to navigate the difficulties of business success and responsibility in this era. What will ATTA success look like? The ATTA membership increasingly connected and exchanging knowledge on The HUB. The organization being known increasingly as a home for leaders. A worldwide tribe of adventure travel pros giving each other a hand wherever need be. This is where we need your help. When you return from this summit, don’t invite everybody to be a part- but do invite the leaders from your region who hold this same success philosophy. What will Summit success look like?